The space is special to me because I used to come when it was the bar formerly co-owned by Ben Affleck and Matt Damon called The Continental. And that was something special you could say about the nearest bar to your first post-college, entry-level job in Los Angeles. Hokusai now occupies the remodeled bar-restaurant and is one of a billion Japanese restaurants in L.A. that is continually toeing the lines between Japanese, Californian and Fusion. The good news is, I can’t get enough of that sort of thing – so I’ve decided to go with it instead of fight it. Would I like to eat fresh food? Absolutely. OK so of course the real reason is that Hokusai is just a few blocks away from where I work. A posting of theirs caught my eye. They offer $7 take-out bento boxes for lunch. Though likely to leave most hungry, it left me satisfied with a small filet of salmon atop rice with 3 tiny sides and salad. I decided to see about their happy hour. Maya of ShopEatSleep and I should know our neighborhood spots, anyway. And I think we were pleasantly surprised. When you see a $1.99 – $4.99 bites menu, usually you expect literal “bites.” But you can choose out of tuna, salmon, albacore or fresh water eel sushi for $2.99 and get two pieces. They aren’t huge but actually respectably-sized. 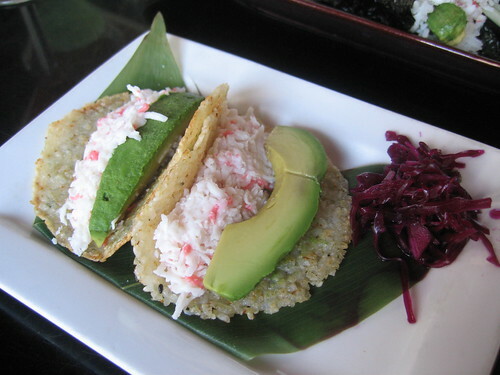 I especially liked their crispy rice tacos (above), which were kind of a modification on the california roll but with crispy rice as the “wrap.” The seafood cigars ($2.99) were a hit – because c’mon, who doesn’t like fried anything filled with seafood? Drinks weren’t bad, either. The bartender did a good job making sure my drink was strong, not too sweet and chilled. Their happy hour special is basically a house martini in one of ten flavors including cantaloupe, lychee (above), Yuzu lemon drop, Yuzu basil mojito, Oishii sugar plum, fuji apple and others. Asian-inspired, indeed. I get it. And kinda like it. All house martinis are $5. One appetizer that did sound interesting for next time is Tako Pops (sliced octopus sashimi with chili oil) for $4.99. At the same price point was rock shrimp tempura atop a leafy salad – available in a creamy spicy or plain sauce. We sampled the spicy, which was a mayo-based kind of tasty. So come to Hokusai. I need this place open for my own nearby, post-work fix! 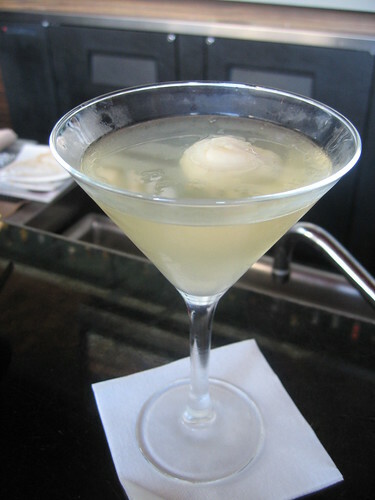 This entry was posted in Beverly Hills, Food, Happy hour and tagged Beverly Hills, Happy hour, hokusai, wilshire blvd. Bookmark the permalink.